Welcome to GEOG 4463 / 5463 - Earth Analytics Bootcamp! 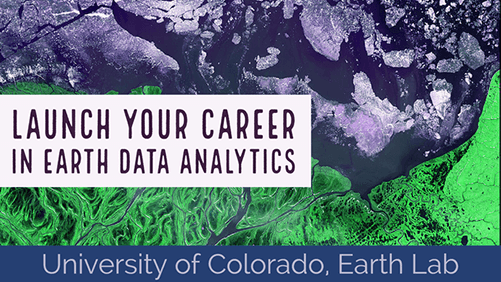 The Earth Analytics Bootcamp is a three-week introductory-level course taught by instructors in Earth Lab and is a part of the Professional Certificate in Earth Data Analytics - Foundations at CU Boulder. In this course, you will learn how to analyze and visualize earth and environmental science data using the Python programming language. You will also learn how to design and implement open reproducible science workflows using Bash/Shell, Git/Github.com, and Jupyter Notebook. This course is highly technical, and you will code every day. We will use the Python scientific programming environment and the Jupyter Notebook graphical interface to work with data. Important: We have a cloud environment (Jupyter Hub) available for you to use for your assignments. However, we encourage you to get Python set up on your own computer as well, as it’s a good skill to have! You will also need to have Bash and Git installed on your computer for several activities in this course. Please follow the instructions on Setting up Git, Bash, and Anaconda on your computer to install the necessary tools for your operating system (Windows, Mac, Linux).